I’m pasting the below from the old blog. Click here to read the comments there; they might be useful for a better understanding of this dialect business. Who says Peshawar and who says Pekhawar? It seems some accents in Pashto say the -sh- as -kh- like I heard a song with dushman as dukhman. Tell us about Pashto dialects/accents 🙂 Thanks. There are two (main) dialects in Pashto, soft and hard. The soft dialect is spoken in Quetta, Waziristan, Kandahar, and other southern Pashtun areas; the hard one is spoken in northern areas, like Peshawar, Swat, Mardan, Dir (in Pakistan) and Nangarhar, Kabul, Jalalabad (in Afghanistan). The map below should help with identifying the northern and southern Pashto-speaking regions. 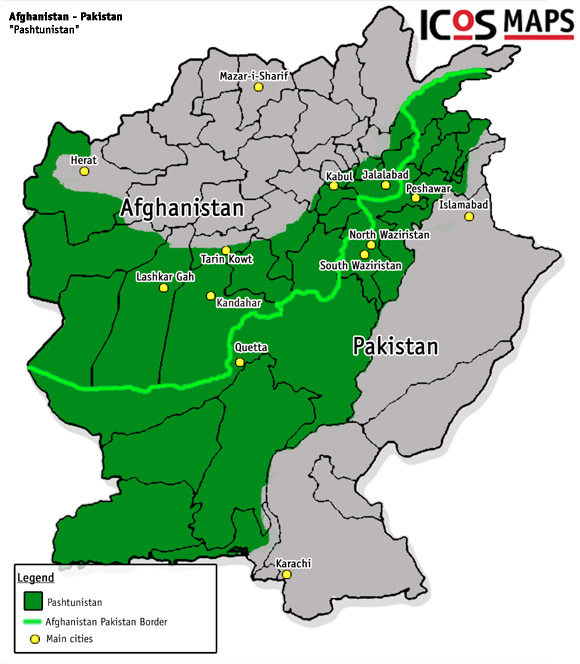 Pashto-speaking regions of Pakistan and Afghanistan together are called Pashtunistan, highlighted in green above. P.S. This map is not perfect. That said, the “kh” (Pekhawar, Pukhtun, Pukhto, Pakhto, kha) is used in the hard dialect. The soft dialect uses “sh” for the same words: Peshawar, Pushtun/Pashtun, Pashto/Pushto, sha. You see, in Pashto, we have more letters than we do in Arabic. One of the ones not included in Arabic is “khin” ( ښ ), and that’s the “kh” sound you hear in the hard dialect. The “sh” sound is the same as “sheen” ( ش ). Pashto and Arabic both have the letter “kha”/”khey” ( خ ), however, so ښ does not replace kha/khey. Me, since I’m from northern Pashtunkhwa, I use the “kh” dialect, but since “kh” is a hell of a difficult letter for most westerners or others who don’t have the letter in their languages, I prefer to use “sh” when talking to a non-Pashtun audience. With my family, though, using “sh” instead of “kh” sounds really weird. There are other differences in the dialects, too. For instance, the soft dialect uses “zh” where the hard dialect uses “g” (e.g., mung vs muzh (both mean we)). You may find more information about the dialects in this article called “Four Varieties of Pashto” by Michael M. T. Henderson. The article, available on JSTOR, shows that it’s actually far more complicated than innocent me is making it! But, hey, this is basically what it all comes down to, I swear. And the list below is of books and other Pashto-learning/Pashto-improvement resources. This entry was posted in Afghans, Books, Pashto, Pashtuns and tagged more, Pashto, Pashtuns. Bookmark the permalink. PLEASE LEARN ALL THE DILECTS AND THE HISTORY OF PASHHTO LANGUAGE..ITS NOT SHEEN OF ARABIC ,,ITS PRONOUNCED AS HKHH..OR SIMPLY GHAZNI,PAKTIA,TAGAB,KUNAR HAVE THE ORIGINAL ONE..WE SOUTH N NORTH ARE TWO EXTREAMS MAKING IT KH OR SH. Calm down, man. Chill. Pashto, like Arabic and Persian and Urdu, has a “sheen” written the same way in these languages. Then there’s a “kh” sound that’s different from the khe/kha of Arabic/Persian/Urdu, written like a seen with a dot on top and dot on bottom. See above. One is Kha sound other is Sha sound. These are not in pashto grammar but they sound like other meaningful words of pashto ! You literally just repeated what I have written above.